We often discuss in the environmental circles the problem of indiscriminate pollution, our dwindling resources and global impacts like climate change. We have framed regulations and standards to control various sources of pollution with monitoring and enforcement bestowed to agencies like the Pollution Control Boards (PCBs) and Urban Local Bodies (ULBs). Despite all these efforts, non-compliance is still an issue; judiciary has now stepped in and staff from PCBs and ULBs spends more time in the courts. I don’t know to what extent we feel safe to live in the environment. 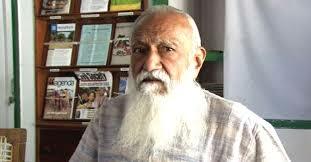 We often miss the issue of soil pollution and land contamination. While we do track the status of our ground water, only recently we have started building our understanding on the extent and severity of groundwater contamination. The findings have been alarming, and many studies have linked the contaminated ground water to the occurrence of cancers. In December 2015, a report was submitted to the Ministry of Environment & Forests & Climate Change (MoEFCC) captioned Inventory and Mapping of Probably Contaminated Sites in India. This report identified 320 contaminated sites. Researchers from IIT Delhi published status on more than 60 dump sites contaminated by disposal of municipal solid waste, outlined remediation efforts needed and articulated challenges such as financial support and lack of standards and guidelines for remediation. Unfortunately, the CBIMP did not produce results that were expected especially to facilitate the formulation of national standards for remediation of contaminated soils. The funds for remediation that were allocated got swapped to address concerns by State Governments on GST! Clearly the Government did not have remediation of contaminated lands as a priority. Today, our soil, agriculture and food continue to remain at utmost risks. Uptake of pollutants (especially heavy metals) in the crops that are cultivated on these lands or on lands nearby results into contaminated food. But the problem of contamination is not just due to industrial wastes and municipal dump sites. It is also due to high consumption of questionable and spurious insecticides and fertilizers in the agriculture. Use of contaminated water for irrigation is yet another contributor. Pesticides have been linked to a range of health problems, including cancer, developmental problems and lower IQ in children. Organophosphates pesticides – which are potent neurotoxins – can damage children’s intelligence, brain development and nervous systems even in low doses. The Environmental Working Group (EWG), a non-profit advocacy agency in the United States releases their list of the most contaminated fruits and vegetables – and apples have been ranked as the most contaminated – fifth year in a row. The Dirty Dozen list includes the top 12 fruits and veggies with the highest amount of pesticide residues. It was found that pesticides persisted on fruits and vegetables even when they were washed or peeled. The FAO report titled ‘Soil Pollution: A Hidden Reality’ was released in 2018 at a two-day global symposium in Rome. This report, which is a synthesis of existing scientific research, identifies six soil-related human health risks and three of them are linked to soil pollution. These are soil contaminated with dangerous elements (for example, arsenic, lead and cadmium), organic chemicals like PCBs (polychlorinated biphenyls) and PAHs (polycyclic aromatic hydrocarbons) or pharmaceuticals such as antibiotics or endocrine disruptors. At present 67 pesticides that have been banned in the US, the EU and other nations are still in use in India. Consequently, the concentration of toxic metals in grains and vegetables grown in contaminated soils have increased at alarming rates. This poses a serious threat to humans and the environment because of its toxicity, non-biodegradability and bioaccumulation. Food Safety and Standards Authority of India (FSSAI) published thresholds for Crop contaminants in 2011. Field investigations have shown that there are several instances where these thresholds are violated posing a great risk to the consumers. But then these “demons lying beneath” do not stop there. There are economic impacts too. India’s exports of grains, fruits and vegetables are now under international scanner and rejections of wheat and rice consignment due to contamination reasons are increasingly seen. Examples are cases of pesticides such as carbosulfan, chlorpyriphos, endosulfan, and quinalphos. If the farmers use these pesticides, their produce in fresh or processed form will have traces of such chemicals and will face rejection in countries such as the US, the EU and Japan. Just to illustrate, the European Commission has recently brought down in basmati rice the maximum residue limit (MRL) level for Tricyclazole, a fungicide used by farmers against a disease, to 0.01 mg per kg from the next year. This was done for all countries. India exports two major aromatic basmati rice varieties — PB1 and 1401 – to the EU. The shipments of these varieties with Tricyclazole MRL at 0.03 mg per kg were accepted so far from India but now a new threshold of 0.01 mg per kg will have to be met. This can certainly hit the export market with Pakistan getting an advantage as it does not use Tricyclazole. Decades of intense agricultural production have left China’s soil seriously polluted and its water depleted. Overuse of fertilizers, together with dumping of industrial waste, is a major factor behind soil contamination. About 3.33 million hectares of China’s farmland is too polluted to grow crops. The contaminated area is roughly the size of Belgium. Given this alarming situation on contaminated lands and food, China is set to become more dependent on imported grains, oilseeds and meat, according to a recent report published by the Food and Agriculture Organization (FAO) and the OECD. This is a huge economic impact unless corrective efforts are orchestrated on priority. Clearly, the circles of understanding pollution are widening. The environmental risks (a term that we seldom discuss) – we are facing today and will continue to face – are beyond our fragmented and limited environmental governance. We need to connect the dots between pollution, water, agriculture and food for a better understanding and towards developing a strategic approach. Of course we still need to worry about BOD, COD, PM10 and the like, but we must think beyond – to understand the pathways of pesticide residues and heavy metals. Remember – what goes to the soil and percolates down, gives only an illusion that the problem is out of sight. The problem however hides only for a while, metamorphoses and rises from beneath like demons in disguise. This post is about how to prepare engaging presentations using mind mapping to bring forth inherent complexity of a topic. It is meant for professors, research scholars and students. I have taken topic of industrial pollution control as an illustration. A bit longish deliberation, but I do hope you will find this post interesting and that it will serve the purpose. Professor was busy in his study on Sunday morning. I saw him sitting on a drawing board with a A2 size paper and color pencils. He seemed so engrossed as he didn’t even notice me. He was writing on the paper some “keywords” and then connecting them and making some side notes. Sometimes he would pause and do some google search and print few documents or note the URLs. Why are you doing this basic stuff Professor? I asked when I saw him picking up a cup of coffee. “Well Dr Modak, I am preparing a “general” presentation on the subject of “industrial pollution control”. Pollution is the introduction of contaminants into the natural environment that cause adverse change. Contamination is the presence of an unwanted constituent, contaminant or impurity in a material, physical body, natural environment, workplace, etc. Control is largely associated with power and having the power to influence people, decisions or processes. It is an important function because it helps to check the errors and to take the corrective action so that deviation from standards are minimized and stated goals of the organization are achieved in a desired manner. “Now what Professor?” I could not resist to ask. “Well, Dr Modak, we now continue asking more questions to ourselves on the subject” said the Professor. Oh, so Professor was essentially mapping his thinking. I realized. “It may be interesting Professor to ask about how can we reduce pollution in the first place. This could be an effective strategy to control pollution. No point to let the pollution happen first and then worry for solution”. I suggested. “Yes indeed”, Professor agreed. “In early days we did not think “upstream” i.e. production stage itself for minimizing pollution. In fact, pollution prevention was not considered as a strategy for pollution control. Professor pulled out a nice infographics explaining the “evolution” that he had researched from the web – of course improving the figure based on his experience. Professor nodded while lighting his cigar. “Yes, I will. But let us continue building this diagram further. By the way, this diagram is called a Mind Map. A Mind Map is an easy way to brainstorm thoughts that occur naturally without worrying about order and structure. It allows you to visually structure your ideas to help with analysis. A Mind Map is thus an intuitive framework around a central concept. A Mind Map can turn a long list of monotonous information into a colorful and highly organized diagram that works in line with your brain’s natural way of thinking. Professor invited me to make contribution to the mind map he had started drawing. “Professor – what about rethinking about the product itself? And the raw materials used?” I put a question. 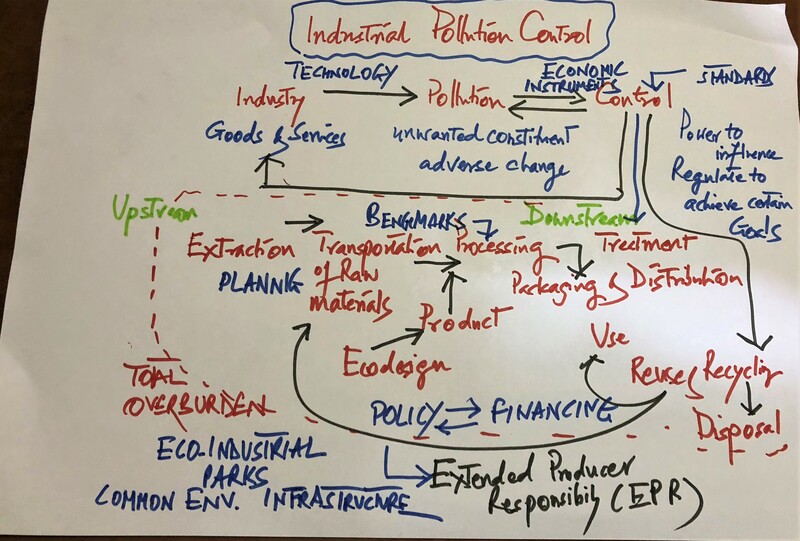 I expanded the mind map further capturing the life cycle consideration with a question in my mind that why should such downstream thinking be discussed in the topic of pollution control. Professor lit his cigar and took a deep puff. “Well Dr Modak, considering both upstream and downstream perspectives in industrial pollution control is a great idea – but this is something hard to “control” isn’t it? The stakeholders are different in each stage of the life cycle and industry may not have enough information, opportunity to participate and control”. Hmm – I said and added “Extended Producer Responsibility (EPR)” in the mind map. The EPR concept was formally introduced in Sweden by my good friend Thomas Lindhqvist in a 1990 report to the Swedish Ministry of the Environment. In subsequent reports prepared for the Ministry, the following definition emerged: “[EPR] is an environmental protection strategy to reach an environmental objective of a decreased total environmental impact of a product, by making the manufacturer of the product responsible for the entire life-cycle of the product and especially for the take-back, recycling and final disposal. Initially EPR was encouraged but now it is getting legislated in many countries – including in India. So we were looking at pollution control not just of controlling emissions through stacks or managing effluents draining out of the premises. That itself could be a good point of discussion in Professors presentation – I thought. We were perhaps heading towards the new avatara of industrial pollution control as “responsible manufacturing”. “You are right Dr Modak in pointing out these two terms”, Professor had a lot to say and he elaborated citing some extracts from literature and shared with me a print of key URLs. Benchmarks tell you where you stand so that you move towards increased resource efficiency and resource recycling to achieve pollution prevention. Standards on emissions bring in the need to come up with technologies that help meet the requirements of compliance to achieve environmental protection. As standards become stricter, costs of compliance increase if you don’t bring in pollution prevention. Best practices provide a guide on how to achieve benchmarks and standards so that the industry is both competitive and compliant. Pollution control is then a logical outcome and not something done solely just because it is mandatory. “Integrated Pollution Control” becomes an opportunity for ecological modernization. Wow, I said to myself. We expanded our Mind Map further. “Remember Dr Modak that we must keep in mind the concept of total overburden and build ecological rucksack in terms of consumption of resources and generation residues across all the media and across all stages of life cycle” Professor spoke slowly but had a lot of emphasis. I understood that this statement was pretty loaded and deep. Perhaps another Mind Map will be required to capture what Professor was arguing. It introduced the need for circularity that each industry should think about and together with the government and communities. Partnership was important. The concept of total overburden also highlighted the need to consider not just technology based solutions but hinted the role played by policies e.g. banning, planning measures (like eco-industrial parks), use of economic instruments like taxes and market mechanisms like pollution trading, influencing consumption patterns and promoting innovative business models with appropriate financing. Role of common environmental infrastructure in achieving pollution control may also be discussed especially for small and medium industries. We were perhaps talking about the industrial pollution control now as a sector and not a case of an individual polluting industry. I attempted to add all these important keywords in the Mind Map. Now the map looked pretty complex. I wasnt fully satisfied though. “Don’t tell me Professor that you are going to prepare slides to cover everything we have expressed in this Mind Map” I was now worried about the audience. “Well, Dr Modak, this is my “general” Mind Map on industrial pollution control; I will decide which parts of this Mind Map need to be focused and emphasized to make my slides depending on the context and the audience. The presentation will be thus customized. Not everything will need to be said” Professor explained as he was probably expecting my question. “I will use less text, more infographics and provide handouts of key materials” Professor added. “No Dr Modak, this is my first time that I will use the technique of Mind Mapping” Professor said this while extinguishing his cigar. And I was simply puzzled with his candid confession. Perhaps, the technique of Mind Mapping was simply “built in” Professors mind. Mind mapping is simply a great fun with lots of learning. The mind map that we created was indeed a “raw” representation. There are several mind mapping freewares that can be used to construct much better visualization, show connections and plugging in the details. If you are interested, then do attempt creating a mind map on industrial pollution control by using some of these tools and build further on the raw map we prepared. I will publish your maps on this post. Do send me a copy at prasad.modak@emcentre.com if you wish to receive any comments or guidance. Will be happy to work with you.